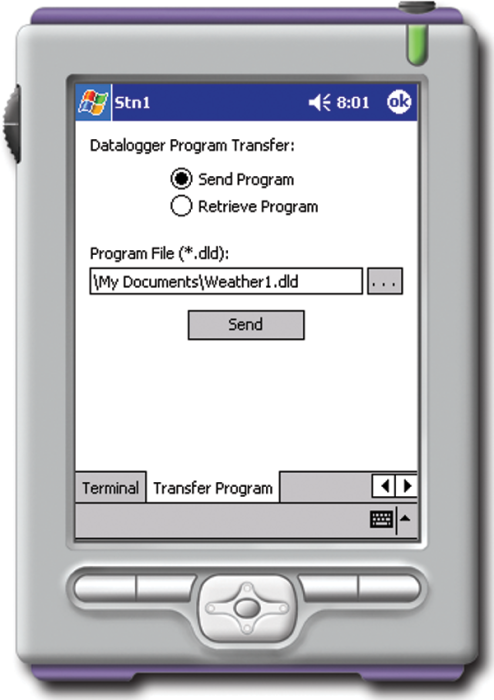 PConnectCE software supports communications between a Campbell Scientific data logger and a PocketPC or Windows Mobile device. PConnectCE allows you to go into the field carrying only your PDA and cables instead of having to lug a laptop computer to communicate with your data logger and collect your data. PConnectCE can be used to collect data from the data logger, and transfer the data to an office PC. Collected data are transferred to the PC during the ActiveSync® process. This process also synchronizes program files between the handheld and the PC. Display real-time data logger measurements. Measurements are updated every two seconds. PConnectCE ships with connectors and cables that assume the PDA acts as a DCE device (data communications equipment), with the 9-pin cable terminating in a female connection. Some PDAs act like a DTE device (data terminal equipment) and the 9-pin cable terminates in a male connection. If this is the case, for communication via the CS I/O port, you will most likely use an SC32B (purchased separately) in place of the PDA-to-CSI/O connector that ships with the software. To communicate via the data logger's RS-232 port, the PDA's serial cable can be plugged in directly to the data logger's RS-232 port (or a standard serial cable can be used if extended cable length is required). There may be exceptions, however, to this general rule. If you have questions about the RS-232 capabilities of your handheld device, check with the device manufacturer. Current Version Version 2.33 began shipping in May 2008. CR1000 The CR200X-series and CR1000 dataloggers require PConnectCE version 2.0 or higher. CR10X (retired) For the CR510, CR10X, and CR23X, support for both the mixed-array and PakBus® data logger operating systems is provided in PConnectCE version 2.0 or higher; prior versions only supported the mixed-array OS. CR200X (retired) The CR200X-series and CR1000 dataloggers require PConnectCE version 2.0 or higher. CR206X (retired) The CR200X-series and CR1000 dataloggers require PConnectCE version 2.0 or higher. CR211X (retired) The CR200X-series and CR1000 dataloggers require PConnectCE version 2.0 or higher. CR216X (retired) The CR200X-series and CR1000 dataloggers require PConnectCE version 2.0 or higher. CR23X (retired) For the CR510, CR10X, and CR23X, support for both the mixed-array and PakBus® data logger operating systems is provided in PConnectCE version 2.0 or higher; prior versions only supported the mixed-array OS. CR295X (retired) The CR200X-series and CR1000 dataloggers require PConnectCE version 2.0 or higher. CR3000 The CR3000 requires PConnectCE version 2.1 or higher. CR510 (retired) For the CR510, CR10X, and CR23X, support for both the mixed-array and PakBus® data logger operating systems is provided in PConnectCE version 2.0 or higher; prior versions only supported the mixed-array OS. CR800 The CR800 and CR850 require PConnectCE version 2.2 or higher. CR850 The CR800 and CR850 require PConnectCE version 2.2 or higher. PConnectCE runs on Windows-based, 32-bit operating system (Windows 95, 98, ME, NT, or XP). After installing PConnectCE on a PDA, how is the software accessed? On the PDA, select Start | Programs | PConnectCE. Is there a demo version of PConnectCE? Is there a version of PConnectCE that works with an iPad? No. Instead use LoggerLink Mobile Apps for iOS and Android. Does PConnectCE allow a user to set up the same type of communication links as with LoggerNet? No. PConnectCE is compatible with direct serial communications (COM1─COM8), Infrared, Bluetooth, and point-to-multipoint RF401 radio communications in a Transparent RF network. For more information, refer to the “Connecting Your Pocket PC Handheld to the Datalogger” section of the instruction manual. If a Windows Mobile device and a PC are synchronized, does PConnectCE have to be installed on both the Windows Mobile device and the PC? PConnectCE is installed on the PC. When the hot sync process is used with the Windows Mobile device, PConnectCE is transferred to the device. For more information, refer to the instruction manual. Can PConnectCE run on the Windows Mobile 6 OS? Can a PDA with PConnectCE be used to set values? Yes. The value of an input location or Public variable can be changed from the Measurements tab. Does PConnectCE work with Windows Mobile 5.0? Is PConnectCE compatible with Windows 7 software? How many devices can one copy of PConnectCE software be installed on?